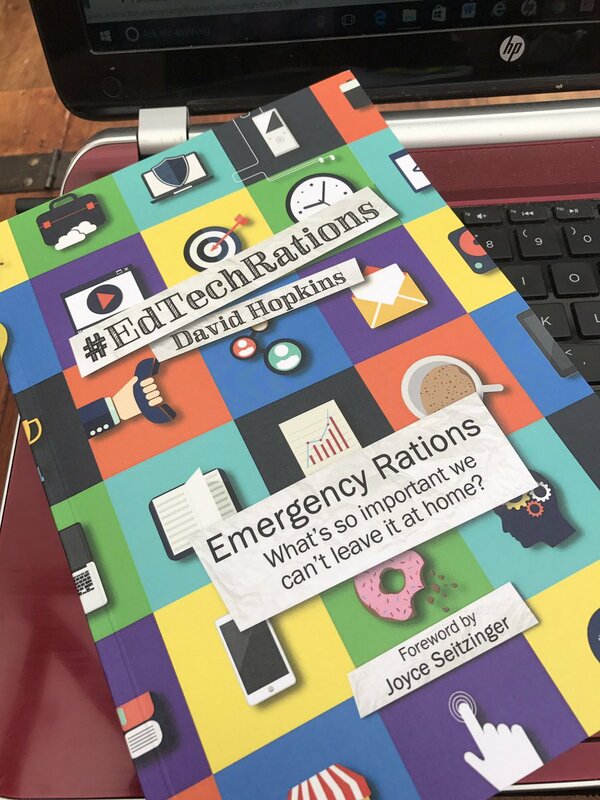 Sue Beckingham: My Learning Journey: #EdTechRations Emergency Rations: What's so important we can't leave it at home? #EdTechRations Emergency Rations: What's so important we can't leave it at home? Another wonderful opportunity to work with David Hopkins has resulted in contributing a chapter to his latest book. I just received my copy today! "What is the technology you find yourself turning around and going home for if you forget it. What can't you leave at home or work, what do you feel naked without? (in your bag, in your pocket, wearable, etc.)? What connects your personal and professional lives to the extent you need to alter your plans to return back to the office to 'rescue'? It would be fantastic to hear your experiences and thoughts on this." The response to the call was amazing and I feel proud to have had my chapter accepted alongside people like Steve Wheeler, Maha Bali, Amy Burvall, Simon Lancaster, Eric Stoller, Jane Bozarth, Sarah Knight, Julian Stodd, Alec Couros and many more. It's fascinating to see the different takes on the challenge and all make for a wonderful read. I know I'm biased but I recommend you get a copy! Many of the authors who have contributed to this book are already valued members of my personal network. However some are new and I am certain will add further value going forward. Whilst many of us may not have met face to face, the contributions they make to the edtech community have helped me develop my own learning in this area and all things related to learning and teaching and more! Thanks must go to David Hopkins @hopkinsdavid who has worked so hard to pull this all together. I can't wait to see what the next challenge will be! flavour of the tech I can't be without. To hear the full story you'll have to go and buy a copy of the book!